One of the best ways to help your horse shine in the ring is to make sure the organs inside your horse are singing in harmony. A dull coat or dry skin can be a sign that one of the elimination organs need a tune up. By targeting the digestive organs and the liver you can improve on the appearance of your horse. However, do check with current rules in regard to prohibited substances in case a favourite herb has been added to the banned list. If your horse has dry and flaking skin, burdock root which cleanses the blood and wakes up the liver, will help with dryness that appears along the mane and around the tail. Marshmallow root can be useful in balancing the secretions in the gut which in turn can balance ‘glug’ in the ears and soothe irritated skin from within. Keeping the liver happy is also useful when addressing tendon and ligament repair as the liver governs the health of connective tissue. Dandelion root and rosehips can be helpful with improving the integrity of this tissue after a muscle or tendon strain. Both these herbs can be given in conjunction with other herbs andas a supportive role to physical therapy. For the horse that gets sore and stiff from the stress of being away from home, it can also benefit from a liver working optimally. 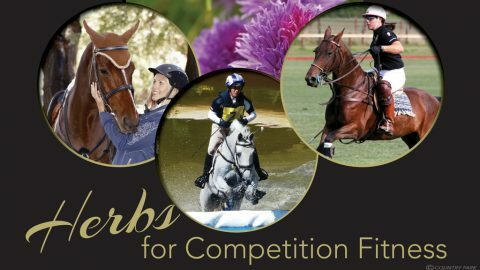 A healthy liver can help the body move lactic acid and inflammation to relieve soreness.Dandelion root combined with turmeric root will help recovery time when leading up to an outing and for the days afterwhere a horse has been stressed floating or competing. To help the horse that doesn’t drink while away from home, adding a teaspoon of the salty tasting celery seed to the feed can encourage thirst. For the horse that goes off feed while away, peppermint leaf tea can be an appetite stimulant. Be aware that products which have contained ‘mints’ have caused positive results when testedat competitions. With dull or blotchy coats, clivers will clean the skin via the lymphatic system and then feed the skin nutritionally to help bring up the best in most coats. Be careful with palominos and dun coloured horses, as sometimes nettles and rosehips can turn the coat smutty. 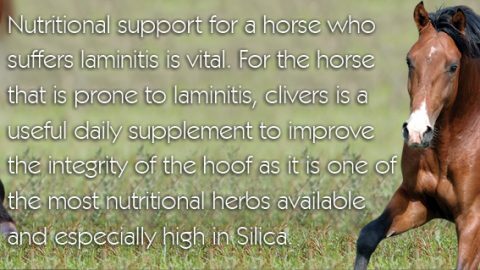 Each horse is different with how they respond and discontinue with these herbs if the colour that comes out is not desirable. If a horse has dropped condition in the off-season or expended a lot of energy during the breeding season, slippery elm bark powder and marshmallow root powder are both demulcent herbs that can assist the gut to utilise nutrients and help return to show condition. Turmeric powder is an anti-inflammatory herb that can help sore muscles when coming back into training as well as address sensitivity from an irritated gut. Where a horse has had urinary issues when travelling, it is always wise to have changes in urine or difficulties assessed by your vet. Cornsilk can be soothing to the renal and urinary system but due to the many possible issues that a change in urination can indicate, a veterinary diagnosis is always recommended before using stronger diuretic herbs, and some diuretic herbs could prove to be prohibited substances. If your horse has had a period of time away from the show ring due to illness, supporting his immune system in recovery with rosehips, clivers, dandelion leaf and licorice root powder can also help with your preparation for his return to showing. For a sick horse that has been stressed, lemon balm and turmeric will assist recovery, especiallyafter a virus or where the gut has become sensitive. However lemon balm is listed as prohibited so not used close to competition time. Most calming herbs are noted as prohibited substances and herbs that should be avoided include chamomile, lemon balm, valerian and kava; along with pain relief herbs containing salicylates such as devils claw, meadowsweet and white willow bark. When testing for prohibited substances, constituents such as valerianic acid, capsciacin and salycilic acid have been mentioned in rules, however all due care needs to be taken when administering any herbs as the levels of swabbable constituents can vary between herbal preparations. It is also important to protect your reputation as some rules consider any substances that claim to calm a horse to be unsportsmanlike. 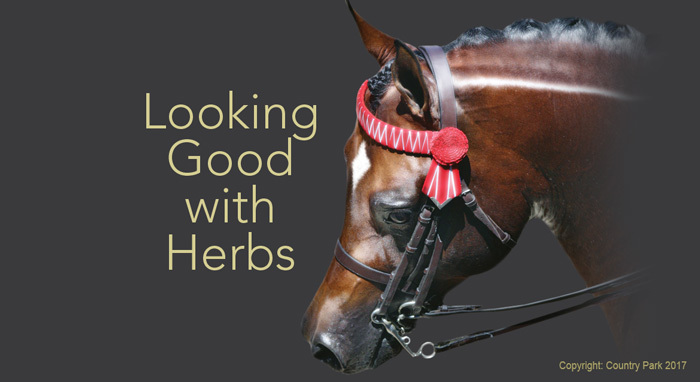 Overall the use of herbs that are classed as ‘gentle’ by herbalists can keep your horse’s body tuned to functioning optimally, be it during breeding season or in the show ring.